My paternal patriarch Thomas Kirk's ancestral background is a towering brick wall. I don't know who his parents were. I don't know where he was born. I only recently determined that he was born in about 1778. His death in 1846 - just before the more informative 1850 census was conducted - has kept him veiled in an impenetrable aura of mystery. 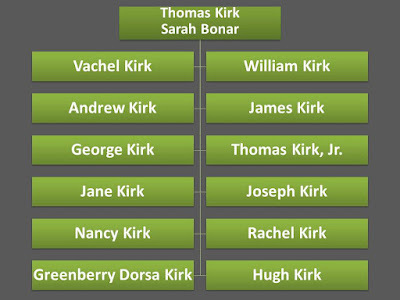 Kirk is a relatively common surname widely found in early US census records, and can be traced back to Ireland, Scotland and England. Were Thomas Kirk and his parents part of the Scotch Irish who settled the expanding western frontier in the 18th and early 19th centuries? Fortunately, Thomas was a prodigious family man (insert euphemism here about his virility) who had, according to family genealogies, at least 12 children with his wife Sarah Bonar. His large family left a record trail with clues about his ancestry. Families of this size were not uncommon for the Scotch-Irish with one researcher noting that these "families tended to be large, seven to ten children per family was not unusual. "1 Two sons, Andrew and George, died in infancy. All but three (Jane, Nancy, and Rachel) were boys. Earlier research indicated that there may have been a fourth daughter, Sarah, who died before adulthood. Furthermore, the 1830 census suggested there may have been yet another daughter born sometime between 1825 and 1830. The lack of information about her suggests that she also died before adulthood. Of Thomas' 12 known children, five were alive at the time of the 1870 US Federal census. Fast forward ten years, and four of those five children were alive to contribute to the 1880 census. Another twenty years later (sure missing the 1890 census right about now! ), and only two were still living to participate in the 1900 US Federal census. These three census records were unique because they asked respondents, for the first time, to identify their parents' birth locations. 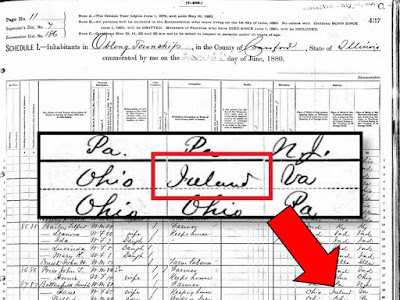 The 1870 census included a box where the enumerator would add a tick mark only if the parent was foreign-born. A blank box would indicate the parent was born in America. All five children gave their father's birth location as US-based. 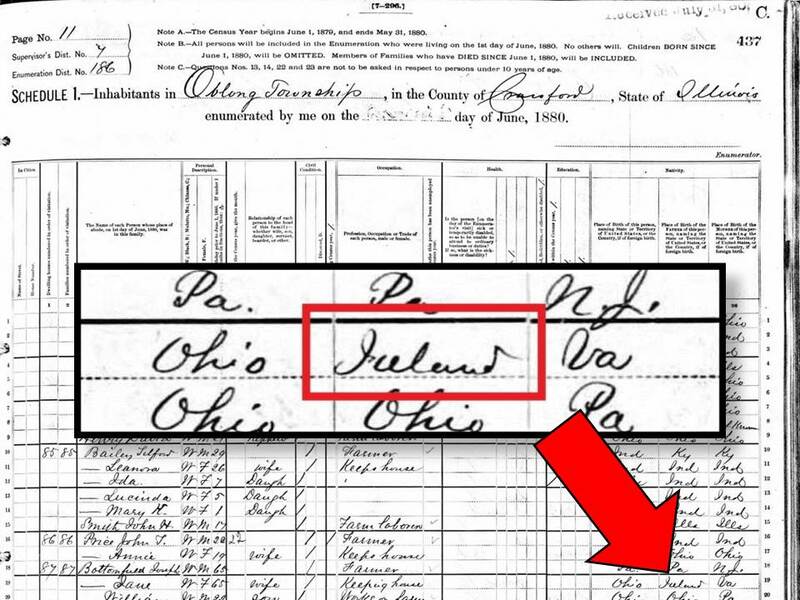 Both the 1880 and 1900 censuses collected more specific detail by including a space to write the name of the parent's birth location. The general consensus suggested that Thomas was born in America and likely Virginia with only a few outliers (Come on, Nancy! Was it Ohio or New Jersey? One of these is not like the other!). The census records for his children point me to Colonial Virginia. The research effort will have to continue there. But what more - if anything - can I learn from Thomas' children, particularly mindful of a possible Scotch-Irish link? 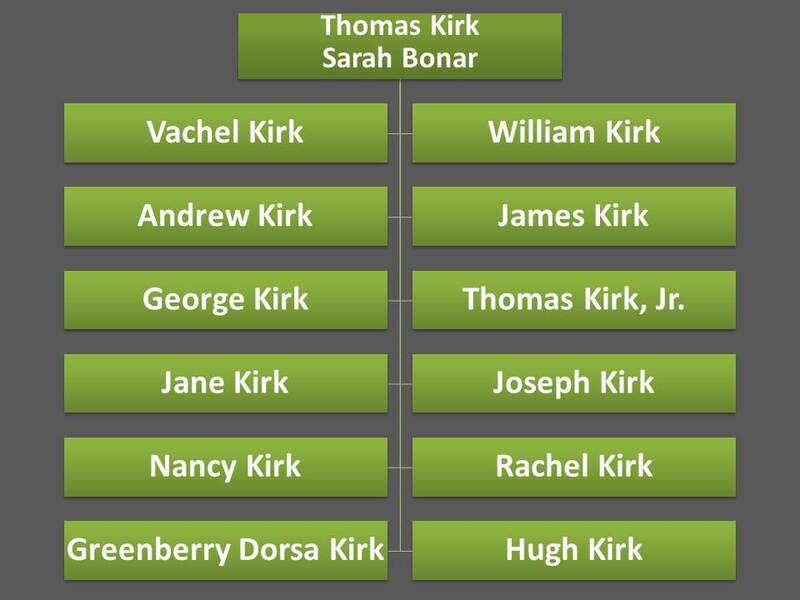 If the Kirks followed Scottish naming conventions3, Thomas would have named his first son after his father and second son after his wife Sarah Bonar's father. We can put this to the test because we know the names of Sarah's parents: William and Jane. Thomas and Sarah's second son was named William. Custom would have also dictated that the first daughter, Jane, was named after Sarah's mother. Both align with the custom! It appears that they did follow the practice. Thomas' first son (and my 4th great-grandfather) was Vachel Kirk. Can I infer that Vachel was the name of Thomas' father? Were there Vachel Kirks of suitable fatherhood age in the records for the time period? The search in Colonial Virginia now has a name to hunt for. 1 McCain, Barry. Finding the McCains: A Scots Irish Odyssey. Oxford, MS: Ulster Heritage Publishing, 2015. Page 20. This is just a thought...I have a Kirk connection who died in Licking County, Ohio. Her name was Mary Kirk, married to Anthony Geiger. Mary lived from 1774-1832. Could she be your Thomas's sister? Mary's parents are believed to be Joseph Kirk and Sarah unknown. Joseph is reported to have been born in 1754 in Ireland and possibly died in 1830 in Washington County, Ky. I haven't found the documentation for any of these statements except Mary's marriage and death, but it may give you someone else to look at. Hi Janice, yes! That's a distinct possibility that I've been exploring. Curiously, a man named Hugh Ford was appointed to appraise Thomas Kirk's estate following his death. This Hugh Ford was married to a woman named Nancy Kirk (or Nancy Ann). Their son son Dr. James Ford wrote a history of the Ford Family, which includes a passage indicating Ann's father was a man named Joseph Kirk. Perhaps the family is starting to come together?